BISS List 12.14.2018 : BEST OF BISS THRU NYE AND BEYOND! Happy Holidays and a Happy New Year BISS Listers! Is it just me or did this year just FLY right by? I cannot believe that it's already December 14th... Not sure if too many of you would know the significance of that date but yeah... it's a doozy! I never know what to call a day like this... Anniversary never sounds like the right word. Tonight, I am going to try to break my three-year streak of missing Chris Robinson Brotherhood at The Fillmore. Three years ago, in 2015, this run of shows fell on 12/11 & 12/12... You can probably do your own math here and understand why I had given my ticket to a friend to stay home... Since then it's been a sad association for this run... But this year, I am going to turn that around! 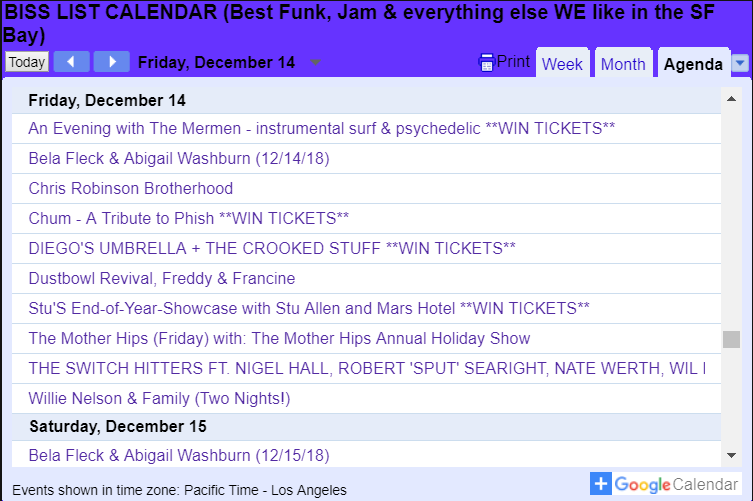 So tonight, 12/14, I am (hopefully) hitting up CHRIS ROBINSON BROTHERHOOD at The Fillmore (http://bit.ly/CRBFillmore2018). Then I am going to follow up with long-time dear friend and super talented musician, Nigel Hall in Switch Hitters feat NIGEL HALL, ROBERT 'SPUT' SEARIGHT, & WIL BLADES (http://bit.ly/NigelHallBBRDec2018). and let us know where you spread the word. Of course, there are TONS of other shows which are at the top of the list for the next month. And I am about to give them to you. I promise to be back in touch with you with another BISS LIst before I leave for my FIRST (yes, seriously) JAM CRUISE! BISS List 11.21.18 : HAPPY THANKSGIVING!! / BEST OF THE BISS THRU DEC 21st! Happy Thanksgiving BISS Listers!! I did a pretty thorough and exhaustive search for you to create the list below of the BEST OF from our full calendar. It's gonna be a good month of events to get you through until the next BISS newletter.... See for yourself!